Macon-Bibb County will celebrate on Monday, March 27, at 11:30 a.m. the reopening of an improved Frank Johnson Recreation Center (2227 Mercer University Drive) with a Ribbon Cutting Ceremony. In attendance and speaking at the Ceremony will be Mayor Robert Reichert, Mayor Pro Tem Bert Bivins, Parks and Recreation Director Reggie Moore, Dr. John Swint with the SPLOST Advisory Committee, representatives from the architectural firm and contractors, and, most importantly, members of Frank Johnson’s family. To help celebrate the reopening of the Center a family fun day will be held on Saturday, April 1, from 12:00 – 2:00 p.m. There will be theatrics, Tae Kwon Do, musical activities, playground games, face painting, bounce houses, food, tours, and registration for programs at the Center. 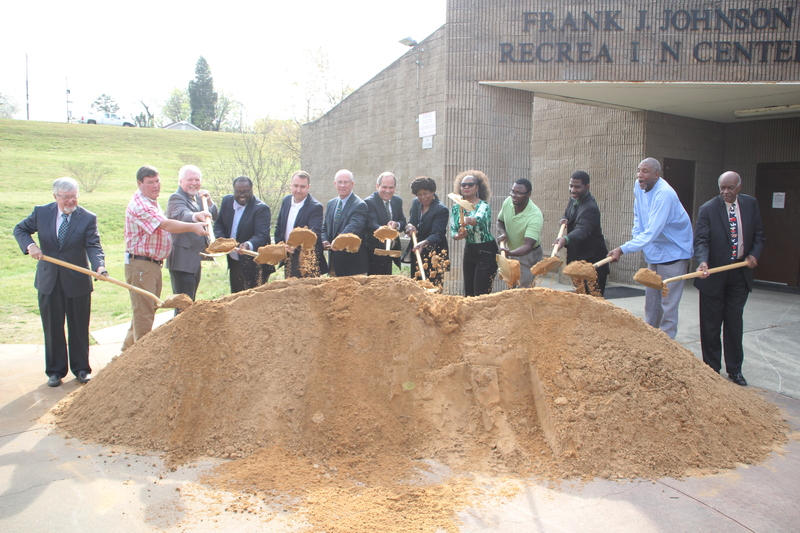 “This is a chance to connect our improved center with the community, and show them how much has changed in the few months,” says Clarence Thomas, Supervisor for the Frank Johnson Recreation Center. This $939,000 project was funded by the voter-approved Special Purpose Local Option Sales Tax (SPLOST). The architect for the project was WM2A Architects, and Cook General Contracting managed the construction services. This phase of the project project included a new addition to the building so it will have a more inviting and safe entrance for people using the facility. There’s also a computer lab, larger meeting room, larger game room, larger multi-purpose room, new weight room, significantly improved bathrooms, new flooring and more. Phase II of the project will include a new gymnasium, weight room, and playground. A groundbreaking ceremony was held to mark the beginning of construction, and a local Boy Scout painted a mural at the Center as his Eagle Scout Project. Click on the links below to watch features from MaconBibbTV on these exciting improvements. The Master Plan for the Frank Johnson Community Center was developed with the assistance of WM2A Architects after three public meetings with people from the neighborhood who use the Center. Their input was instrumental in determining how the SPLOST funds would be used to improve and upgrade the building to meet their needs. The current SPLOST was approved by voters in 2011, with collections beginning in 2012. It would fund improvements, upgrades, construction, and more for six years or until $180 million was collected. Thanks to this additional penny – which studies have shown is paid mostly by people traveling into or through Macon-Bibb – there is a new Animal Welfare Center, new Juvenile Justice Center, three new fire stations, $39 million in new or improved recreation facilities, a new public safety radio system, vehicles and equipment for law enforcement, road and storm drainage repair, and more. The voters of Macon-Bibb County have approved a continuation of the SPLOST, and it is expected to raise $280 million. It includes the next phases of recreation projects, federally-mandated closure of the landfill, courthouse renovations, runway extension at the Middle Georgia Regional Airport, stormwater repair and upgrades, public safety projects, and more. To develop the list of what was included, the County hosted a series of community meetings to hear directly from people. You can read about the projects and what else is included in the planned SPLOST here. To see the active and completed projects covered under the current program, check out the detailed SPLOST site.